That’s the Yuracrumiyoc Pass in the Urubamba region of the Andes in Peru. It was a breathless view from the top. Mainly because it’s nearly 4700m above sea level and we’d got there through a foot of snow. The descent was just as hard going, picking our way down the other side, until I worked out there was a much easier way. I sat on a plastic bag, my walking pole across my knees and slid down it on my backside. Thus proving to yet another new group of friends that I am completely out of my mind. 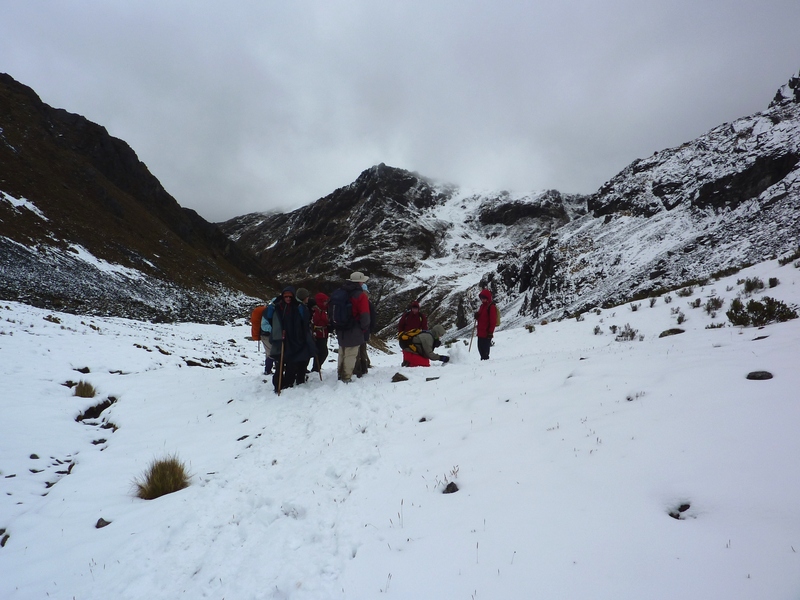 This entry was posted in Challenges and tagged Descent, Peru, postaday, postaweek, Yuracrumiyoc Pass. Bookmark the permalink. Sounds like fun! I found going down mountains harder than going up, but you found an easier way!! A couple of them did follow suit, actually, so maybe I wasn’t seen as quite all that mad. Such a lark. Ouch…..I did a natural water slide once and it was not comfy. I think 4700m would be a bit much to do on one’s bottom! Glad you made it okay! Sounds like you were the smart one! What an adventure! It sound a bit like a hard-drive to me. Did the alpacas stare at you in your way down or did they spit? The llamas had run away by then (true story). We only had a horse. It gave me a long hard look down its nose. Damn .. I have a sudden craving …. I so admire this accomplishment. It’s a special sort of person that climbs mountains…in the snow. But Heather, darling, this sounds completely terrifying. How does one steer an out-of-control plastic bag down a Peruvian mountain? I’m sticking to windy airplane landings…. Well, Barbara, a sturdy wooden walking pole (complete with decorative Peruvian woven handle of course) is an absolutely essential item in such manoeuvres. COL!!!! And does one shriek the whole way down? I think I would do the same 🙂 This is a breathtaking view and photo!